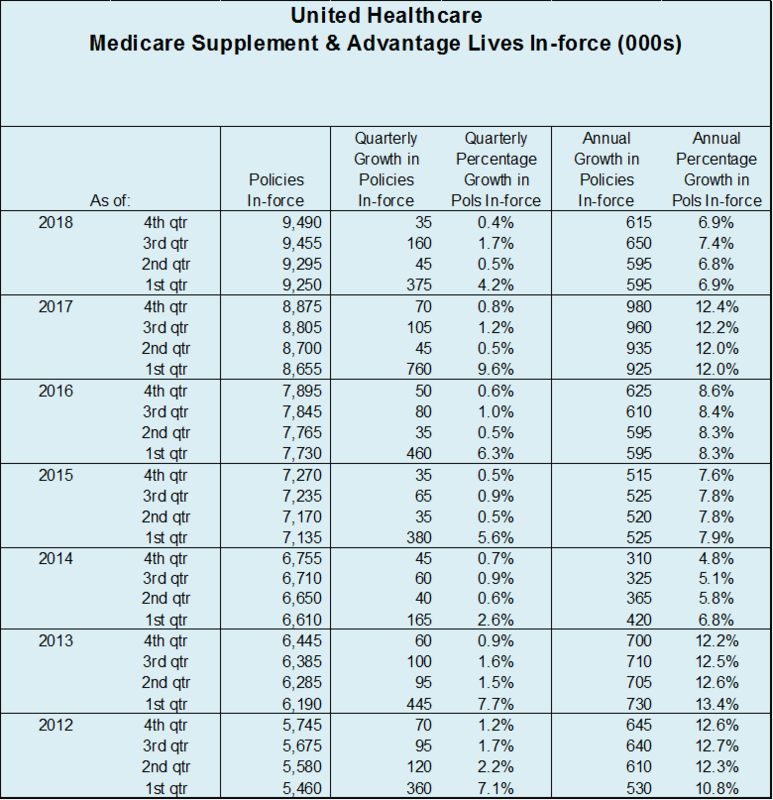 Medicare Supplement market leader United Healthcare (UHC) released 4th quarter 2018 financials on January 15th, adding 5,000 Medicare Supplement lives in the 4th quarter, an 83% decrease from the lives added during 4th quarter 2017. The first UHC enrollment table below reflects Standardized and Modernized policy in-force counts of 4,545,000 as of 12/31/2018, a 100,000 increase in the past 12 months. The 100,000 lives growth in 2018 is a 2.2% increase over the in-force lives at year-end 2017. The 5,000 lives added in 4th quarter 2018 is the lowest number of Medicare Supplement lives added in a single quarter over the past 12 years. 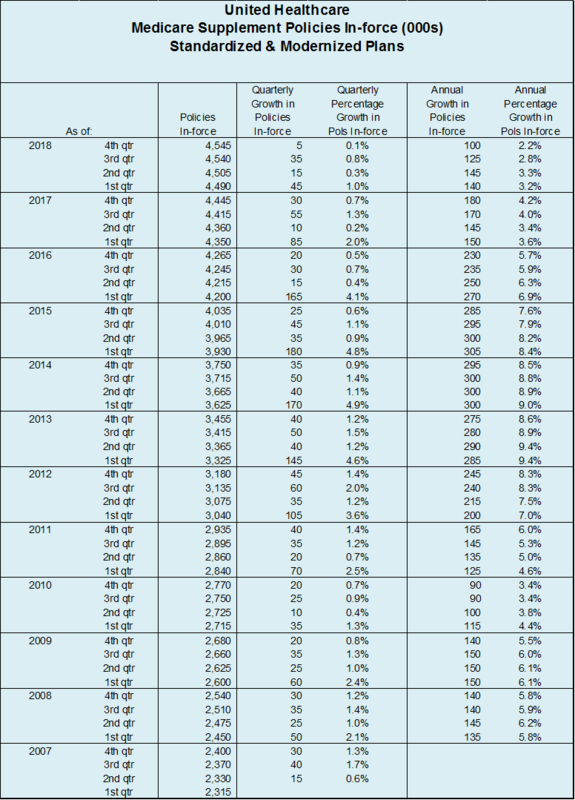 This UHC enrollment table shows Medicare Advantage enrollment counts of 4,945,000 as of 12/31/2018, a 515,000 increase in the past 12 months. The 515,000 enrollment increase in 2018 is an 11.6% increase over the Medicare Advantage enrollment counts at year-end 2017. This combined UHC enrollment table shows Medicare Supplement and Medicare Advantage enrollment counts of 9,490,000 as of 12/31/2018, a 615,000 increase in the past 12 months. The 615,000 enrollment increase in 2018 is a 6.9% increase over the combined enrollment counts at year-end 2017. 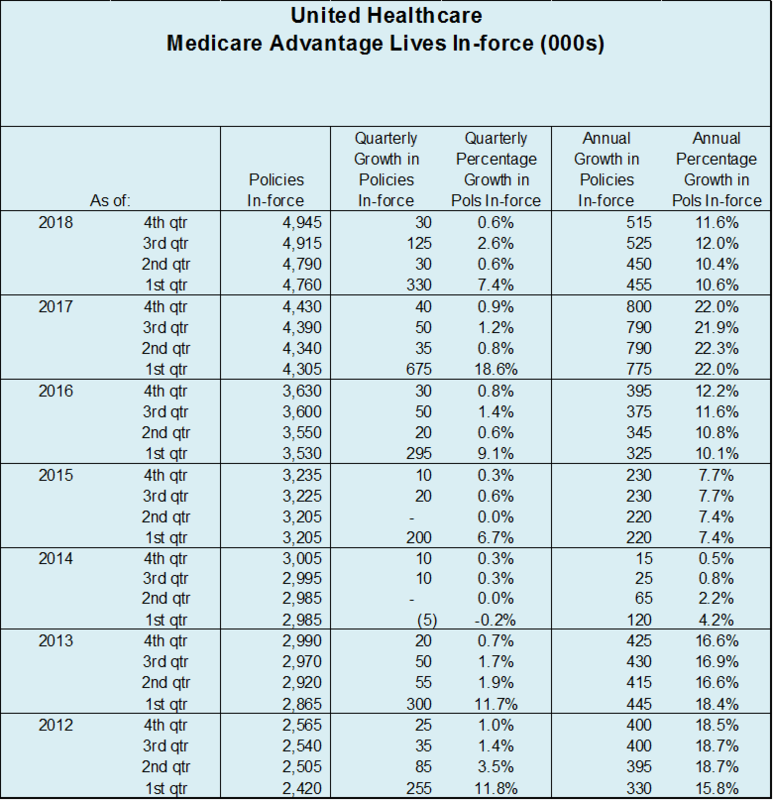 UHC’s combined Medicare Supplement and Medicare Advantage enrollment of almost 9.5 million at year end 2018 is approximately 16% of the overall Medicare enrollment at that same point in time.